Dataguise delivers the most precise data-centric security solution that detects, audits, protects, and monitors sensitive data assets in near-real time for Hortonworks Data Platform (HDP). 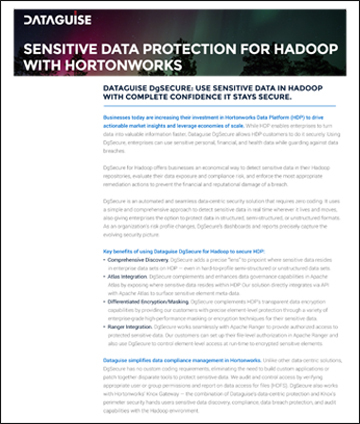 Dataguise DgSecure for Hadoop solution takes full advantage of HDP’s optimized ecosystem components and provides efficient and precise security across the enterprise data landscape regardless of which Hadoop file types and formats are used. Dataguise adds a precise sensitive data “lens” to pinpoint where sensitive data resides in enterprise data sets on HDP even in hard-to-profile semi-structured or unstructured data sets. Dataguise complements and enhances data governance capabilities in Apache Atlas by exposing the knowledge of where sensitive data resides within HDP. Our solution directly integrates via API with Apache Atlas to surface meta-data regarding sensitive elements found from Dataguise’s efficient and nuanced data discovery capabilities directly within Apache Atlas. Dataguise complements HDP’s transparent data encryption capabilities by providing customers with precise element-level protection via a variety of enterprise-grade highly performant masking or encryption techniques for their sensitive data. Dataguise solution works seamlessly with Apache Ranger to provide authorized access to protected sensitive data. Our customers can set up their file level authorization in Apache Ranger and additionally use Dataguise to control element-level access at run-time to make authorization decisions for user access to sensitive elements. DgSecure provides improved visibility into the sensitive data landscape in HDP and its protection status for our customers via our central dashboard and reporting components. Additionally, as data enters Hadoop, DgSecure can inspect and detect all data sources for sensitive data according to the customer’s policy classification (including out-of-the-box support for PII, HIPAA, and PCI data elements) and optionally mask, redact, or encrypt data that customers deem to require enhanced protection. Dataguise also enables our customers to perform Hadoop data consolidation and breach risk management by using our protection capabilities in conjunction with analytics tools and frameworks including HIVE, SAS, and other analytic frameworks. Using Dataguise DgSecure combined with HDP, enterprises can safely unlock and extract value from their investments in HDP platform by enabling information to be shared and managed responsibly and with fine grained security. For more information, contact Dataguise at [email protected] or visit www.hortonworks.com.